Lake Tahoe's western shore is sprinkled with wilderness areas, beaches, many attractions, small towns, and real estate developments. Old money and new has vacationed on Lake Tahoe's western shore for a hundred years or more. The legacy of yesterday's elites is preserved in such attractions as Vikingsholm Castle and Ehrman Mansion. Traveling west on Hwy. 89, visitors will pass near the Tallac Historic Site, Fallen Leaf Lake and Cascade Lake, before arriving at Emerald Bay State Park. With pristine beauty, numerous trails, Vikingsholm Castle, Fannette Island, and Eagle Falls, visitors can easily spend several days enjoying the park's natural beauty. Continuing north on Hwy. 89, along the mountainside through D.L. Bliss State Park with its Balancing Rock. Rubicon Point in D.L. Bliss is one of Tahoe's more popular scuba diving spots. Meeks Bay is the next significant town you will encounter. Tahoma is next, and located next to Sugar Pine Point State Park with its forests of pine, juniper, aspen, and fir trees. Wireless Internet is available here within 200 ft., of the Carriage House so visitors can stay connected while connecting with the surrounding wilderness or fishing the incredibly clear General Creek. The park has an excellent Nature Center. Tahoe City is situated at the head of the Truckee River. The Lake Tahoe Dam and the Gatekeeper's Cabin Museum are here as are the Tahoe City Golf Course and Burton Creek State Park. The Truckee River provides plenty of recreational fishing, kayaking, and rafting. Hiking and cross-country skiing are facilitated in the nearby Burton Creek State Park by six miles of unpaved roadways. The western shore of Lake Tahoe has numerous campgrounds with and without various amenities like RV hookups. 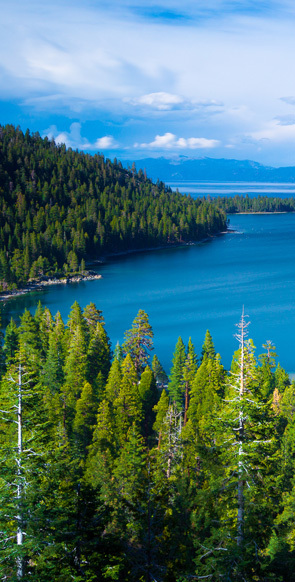 They include: Camp Richardson, Fallen Leaf Lake, Emerald Bay State Park, D.L. Bliss State Park, and Sugar Pine Point State Park, among others. In general, reservations are recommended for all of these campgrounds.